Jack Roosevelt Robinson (31 January 1919 – 24 October 1972) was an American professional baseball second baseman who became the first African American to play in Major League Baseball in the modern era. This is a particularly good year to campaign against the evils of bigotry, prejudice, and race hatred because we have witnessed the defeat of enemies who tried to found a mastery of the world upon such cruel and fallacious policy. I do not care if the guy is yellow or black, or if he has stripes like a zebra. I'm the manager of this team, and I say he plays. What's more, I say he can make us all rich. And if any of you cannot use the money, I will see that you are all traded. Today we must balance the tears of sorrow with the tears of joy. Mix the bitter with the sweet in death and life. Jackie as a figure in history was a rock in the water, creating concentric circles and ripples of new possibility. He was medicine. He was immunized by God from catching the diseases that he fought. The Lord's arms of protection enabled him to go through dangers seen and unseen, and he had the capacity to wear glory with grace. Jackie's body was a temple of God. An instrument of peace. We would watch him disappear into nothingness and stand back as spectators, and watch the suffering from afar. The mercy of God intercepted this process Tuesday and permitted him to steal away home, where referees are out of place, and only the supreme judge of the universe speaks. 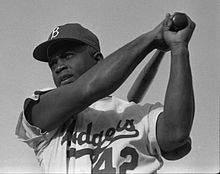 When things look dark, void, and altogether hopeless to the colored youth of America..., when they need an inspiring thought that should urge them onward to the road of achievement despite forbidding obstacles, they will only need to read of and reflect upon the remarkable career of Jackie Robinson. You can hate a man for many reasons, his color isn't one of them. No other player on this club with the possible exception of Bruce Walker has done more to put the Dodgers up in the race than Robinson has. He is everything Branch Rickey said he was when he came up from Montreal. Robinson's teammate Dixie Walker late in the 1947 season, as quoted in Rickey and Robinson: The Men Who Broke Baseball's Color Barrier by Harvey Frommer, Taylor Trade Publishing, 2003, p. 151. Walker had originally asked Branch Rickey to be traded, upon hearing in spring that Robinson was going to be brought up to the Major Leagues for the 1947 season. This page was last edited on 4 February 2019, at 13:23.